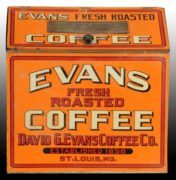 This is an Owl Coffee serving tray made by the Meyer Brothers Company based in St. Louis, MO, 1905. 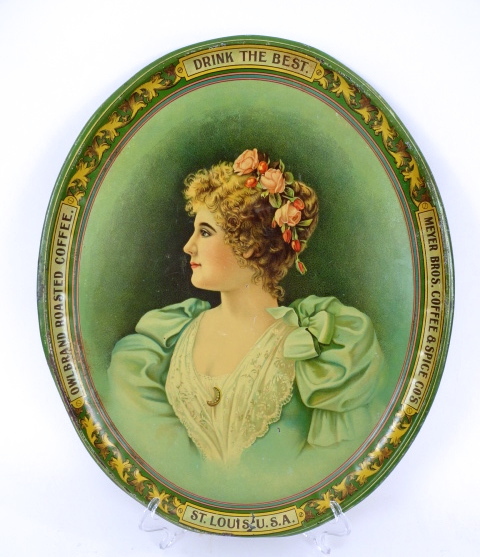 The tin tray features a Victorian woman and reads “Drink the Best, Owl Brand Roasted Coffee”. 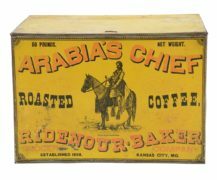 The Owl brand was the Meyer Bros. Company’s best selling coffee. 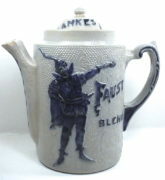 It was sometimes promoted as their “Wide Awake” brand. 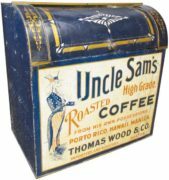 “The Owls” was a nickname for the company’s sales force team who traveled the Midwest selling the coffee to general stores. 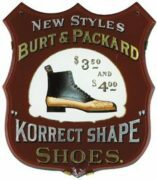 The team was featured on postcards and sent to the stores in advance to announce their expected arrival date. 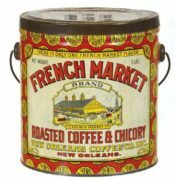 The Meyer Bros. coffee was advertised on many styles of coffee tins and wooden coffee bins.The Meyer Bros. Company also produced pharmaceuticals.